As I pack my bags and head to Thailand for a vacation (for forex research purposes…yeah right), I thought it would be appropriate to blog about the Thai Baht’s strength. The momentum behind the Baht has been nothing short of incredible, and as often happens in the forex markets, the currency’s rise is becoming self-fulfilling. It has already appreciated 8.5% over the last year en route to a 13-year high, and some analysts predict that this is just the beginning. The last time I travelled to Thailand, in 2004, the Baht was trading around 40 USD/THB, compared to the current exchange rate of 30.7. That’s pretty incredible when you consider that during the intervening time, Thailand experienced a military coup and related political instability, as well as a financial crisis that dealt an especially heavy blow to the world’s emerging market currencies. And yet, if you chart the Baht’s performance against the Dollar, you would have only the faintest ideas that either of these crises took place. To be sure, the financial crisis exacted a heavy toll on Thai financial markets and the Thai economy. Stock and bond prices lurched downward, as foreign investors moved cash into so-called safe haven currencies, such as the US Dollar and Japanese Yen. 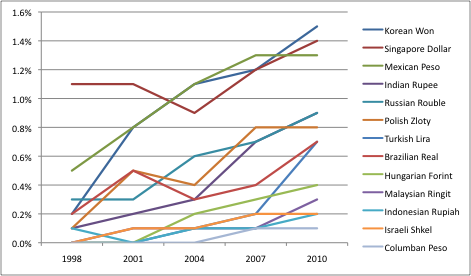 However, the Thai economy was among the first to emerge from recession, expanding in 2009, and surging in 2010. “Compared with a year earlier, GDP rose 9.1%, while the economy grew 10.6% in the first half,” according to the most recent data. Tourism, one of the country’s pillar industries, has already recovered, along with exports and consumption. Projected export growth of 27% is expected to drive the economy forward at 7-7.5% in 2010, according to both the IMF and Thai government projections. The consensus is that growth would have been even more spectacular (perhaps 1-2% higher) if not for the politcal protests, which were finally quelled in May of this year. Despite concerns about risk and volatility, foreign investors are once again pouring funds in Thailand at a record pace. Over $1.4 Billion has been pumped into the stock market alone in the year-to-date. As a result, “Thailand’s benchmark SET Index has rebounded30 percent since May…helping send the SET to its highest level since November 1996.” Capital inflows are also being spurred by Thai interest rates, which are rising (the benchmark is currently at 1.75%), even while rates in the industrialized world remain flat. At this point, the cash coming into Thailand well exceeds the cash going out, which remains low due to steady imports and restrictions on capital outflows by Thai individuals and institutions. This imbalance is reflected in the Central Bank of Thailand’s forex reserves, which recently topped $150 Billion, more than 50% of GDP. Anticipation is building that Thailand will use some its reserves to try to halt, or even reverse the appreciation of the Baht. After last week’s intervention by the Bank of Japan, such intervention is now seen not only as being more acceptable, but also more necessary. Due to pressure from the Prime Minister, the Central Bank has convened at least one emergency meeting to determine the best course of action. So far, members can only agree that restrictions on capital flows and lending standards to exporters should be relaxed. For what it’s worth, Thailand’s richest man has urged the Central Bank not to act: “The effort is likely fruitless as foreign capital is expected to incessantly flood into Thailand because of the country’s healthy economic recovery and export growth. The baht as a matter of fact should become even stronger should Thailand’s politics remain in normal condition.” He is supported by the facts, which show that the Thai export sector has held up just fine in the face of the rising Baht, though perhaps only because other Asian currencies have risen at a comparable pace. If other Central Banks were to step up their intervention – (Deutsche Bank has argued, via the chart below, that all “Asian central banks have for many years been more or less persistently in the market “stabilizing” their currencies, but with a clear bias towards preventing USD depreciation in this region”) – the Bank of Thailand would probably have no choice but to follow suit. The long wait is over! The Bank of International Settlements (BIS) has just released the results from its Triennial Central Bank Survey of Foreign Exchange and Derivatives Market Activity, conducted in April 2010. The report contains a veritable treasure trove of data, perhaps enough to keep analysts busy until the next report is released in 2013. [Chart below courtesy of WSJ]. First, the data confirmed earlier reports that average daily forex volume had surged to a record level in 2010: “Global foreign exchange market turnover was 20% higher in April 2010 than in April 2007, with average daily turnover of $4.0 trillion compared to $3.3 trillion. The increase was driven by the 48% growth in turnover of spot transactions, which represent 37% of foreign exchange market turnover. 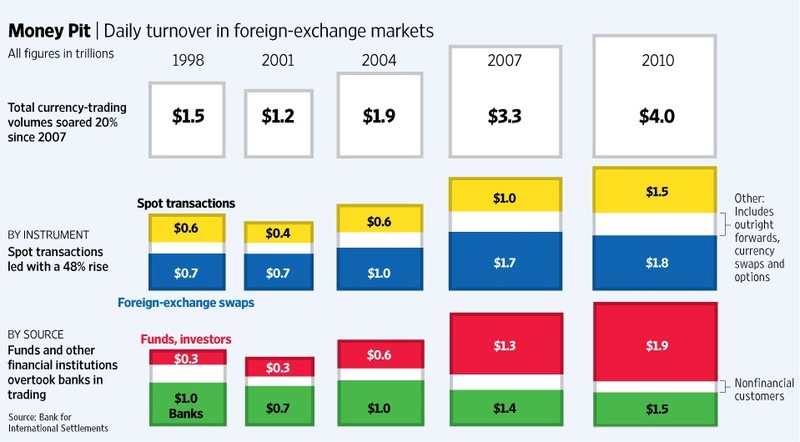 The increase in turnover of other foreign exchange instruments [consisting mainly of swaps and accounting for the majority of forex trading activity] was more modest at 7%.” In addition, for the first time, investors and financial institutions accounted for a larger share of turnover than banks, whose trading activity has remained roughly unchanged since 2004. 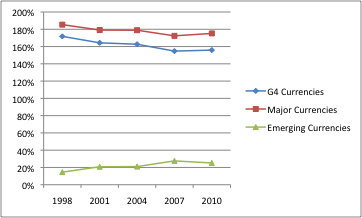 The composition of the turnover actually didn’t change from 2007, interrupting a shift which had been taking place over the previous 10 years. Specifically, the share of overall turnover accounted for by the so-called major currencies actually increased in 2010, from 172% to 175%. [Since there are two currencies in every transaction, total volume sums to 200%]. 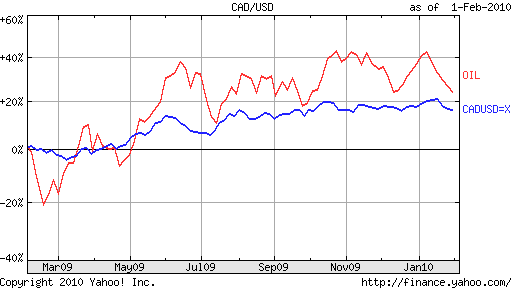 Growth in the G4 currencies (Dollar, Euro, Pound, Yen) was more modest, however, increasing from 154% to 155%. This reversal is probably attributable to the credit crisis, which drove (and in fact, continues to drive) investors out of emerging market currencies and back into safe haven currencies, namely the Dollar, Yen, and Pound. However, this theory is belied by the significant increase in Euro trading activity, which certainly hasn’t benefited from the recent trend towards risk aversion. While emerging currencies as a group accounted for a smaller share of overall activity, certain individual currencies managed to increase their respective shares. The Singapore Dollar, Korean Won, New Turkish Lira, and Brazilian Real all fit into this category. Still other currencies, such as the Indonesian Rupiah and Malaysian Ringgit, also managed impressive gains but account for such a small share of volume as to be insignificant when looking at the overall the picture. Those who were expecting even bigger growth should remember that it’s ultimately a numbers game: the amount of Ringgit it outstanding is dwarfed by the number of Dollars, so any gains that the Ringgit can eke out are impressive. In addition, when you consider that the overall forex pie is also increasing, the nominal increase in volume for these small currencies was actually quite large. Due to the lack of liquidity and higher spreads, these obscure currencies aren’t really suitable for trading. Of course there will be a handful of institutional and even retail investors that want to make long-term bets on these currencies. They tend to be more aware of the risk and less sensitive to the higher cost and lower convenience. The overwhelming majority of traders, however, churn their portfolios daily, if not hundreds of times per day. A 10pip spread on the USD/MXN (Dollar/Mexican Peso) would be considered too high, let alone a 50 pip spread on any transaction involving the Ukrainian hryvnia. In short, the majors will account for the majority of trading volume for the foreseeable future, regardless of what happens to the Euro. At the same time, that won’t prevent a handful of selected emerging currencies, such as the Chinese Yuan, Indian Rupee, Brazilian Real, and Russian Ruble from increasing their share. 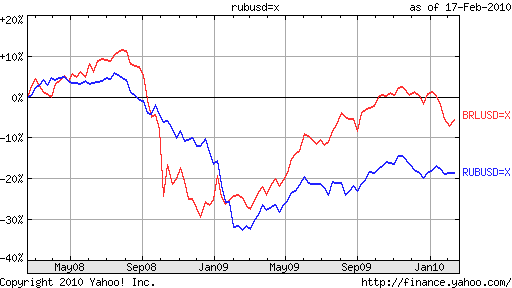 As liquidity rises and spreads decline, volume will increase, and their rising importance will become self-fulfilling. How will Foreign Investment Tax Affect the Real? On October 20, the executive office of the government of Brazil enacted an emergency measure, calling for a 2% tax on on all foreign capital inflows. And with one foul swoop, this year’s 35% rise in the Real had come to an end, right? The tax certainly took investors by surprise, with the Brazilian stock market falling by 3% and the Real falling by 2%, the largest margins for both in several months. The tax is comprehensive and applies to essentially to all foreign capital deployed in Brazilian capital markets, whether fixed income, equities, or currencies. While the tax doesn’t apply to those currently invested in Brazil, the possibility that it would cause potential investors to stay away was enough to cause a sell-off. According to cynics, however, the tax is a backhanded effort to raise revenue to fund a growing budget deficit. The government continues to spend money (perhaps to offset the negative impact on exports brought on by the Real’s rise) as part of its stimulus plan, but is increasingly tapping the bond markets to do so. The tax is expected to bring in an impressive $2.3 Billion over the next year, which could go part of the way towards fixing the government’s fiscal problems. The real question, of course, is how the Real will fare going forward. The initial reaction, as I said, was ‘The Party’s over…‘ But investors with a longer-term horizon aren’t fretting. “In the medium term, the measure will have a limited impact. The fundamentals point to a stronger real, with commodities rising and the dollar weakening globally,” asserted one economist. While investors aren’t happy about paying an arbitrary 2% fee to the government, such pales in comparison to the 10%+ returns that investors still aim to reap from investing in Brazil over the long-term. Ignoring the possible bubbles forming in Brazilian capital markets (admittedly, a dubious suggestion), Brazil still looks like a good bet, especially on a comparative basis. Interest rate futures point to a benchmark interest rate of 10.3% at this time next year, compared to ~1% in the US. 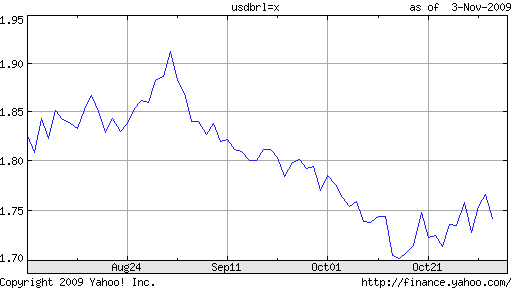 Even after accounting for inflation and the 2% tax levy, the yield spread between Brazil and the US remains impressive. For that reason, the Real has already stalled in its expected fall against the US Dollar, standing only 1.7% below where it was on the day the tax was declared. There are also implications for other (emerging market) currencies. As I wrote earlier this week (“Central Banks Prop Up Dollar“) a number of Central Banks have already intervened or are currently mulling intervention in forex markets, to push down their currencies. You can be sure that other governments will be studying the situation in Brazil closely, with the possibility of implementing such policies themselves. In forex, timing is everything. 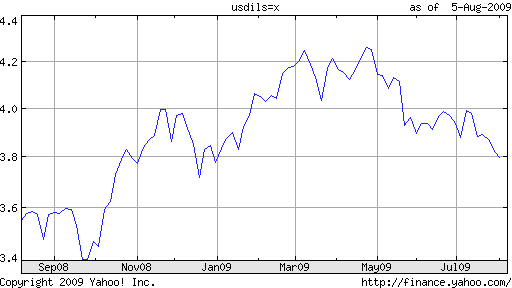 If I had written this post a couple weeks ago, the headline would read “Euro Touches 2009 High.” Perhaps if I had waited another week, it would have read, “Euro Approaching 2009 High.” But alas, I chose today to write about the Euro, and the headline I chose is probably the most appropriate under the circumstances. This notion might have some merit, considering that fundamentals arguably favor a continued Euro appreciation. “The economy of the 27-country European Union shrank 0.3 percent in the three months ended June 30, for an annual rate of roughly 1.2 percent. 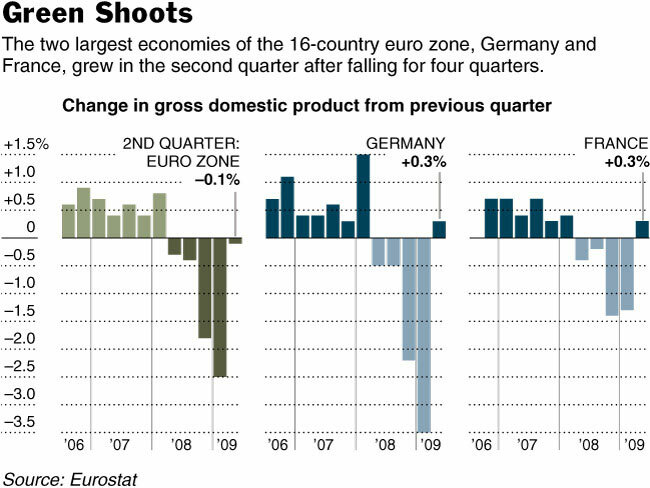 The 16 countries that use the euro registered a 0.1 percent decline for the second quarter, or an annual rate of roughly 0.4 percent.” While output remains well below its 2008 levels, the slight contraction represents a tremendous improvement from the first quarter, when GDP shrank by 2.5%. Still, explorers looking for bad news and/or cracks beneath the surface will have no difficulty finding them. German exports (and output in general remain down year-over-year. In addition, there are still trouble spots in the EU, notably in western Europe. “Already, the euro area’s unemployment rate stands at 9.4 percent, its highest level in 10 years, and the anemic growth of the coming quarters will not be enough to arrest the slide. That, in turn, could drag down consumer confidence or even generate political backlash in Europe, economists said.” Most worrying is perhaps that, “consumer prices in the euro area dropped 0.6 percent in July…” ‘Deflation is becoming entrenched in the euro area, which would be very bad for the economy.’ ” Good thing the ECB left some room to lower rates further. Over the last year, Israel has quietly amassed one of the world’s largest repositories of foreign exchange reserves. On average, the Central Bank of Israel has purchased $100 million worth of Dollars every day since July 2008, bringing its total reserves to $52 Billion. The Bank’s goals are twofold: to sterilize the inflow of speculative money pouring into Israel in order to mitigate inflation, and to stem the appreciation of the Shekel. Towards this latter, the Bank received a boost by the credit crisis, which caused an outbreak of risk aversion and sent investors rushing to shift funds into so-called safe haven countries/currencies. 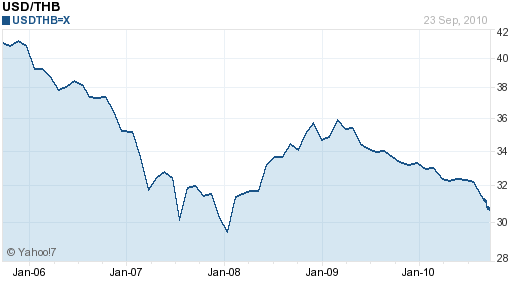 As a result, the Israeli stock market tanked, and the Shekel plummeted 30% in a matter of months. The Bank has also taken steps to inadvertently degrade its currency by lowering its benchmark interest rate to .5%, and buying bonds on the open market. “The central bank will have bought a total of 18 billion shekels ($4.7 billion) of bonds when it completes the program….The bank said in its statement that it does not intend to sell the securities it purchased and will continue buying foreign currency.” While its unclear whether the program has succeeded in stimulating the economy – which contracted by 3.7% last quarter – it has provoked inflation, which is still running in excess of 3% per year. Analysts, meanwhile, insist that the Shekel’s appreciation is not unusual, and that the intervention runs counter to fundamentals. “[The] market pressures strengthening the shekel against the dollar, are, in fact, consistent with underlying economic conditions. Fundamental economic conditions favoring the revaluation of the shekel include the accumulation of a balance of payments credit of $4.3 billion over the past thee quarters.” These analysts, then, are more concerned about rising inflation then about the competitiveness of Israeli exports. Barclays, an investment bank, evidently subscribes to this school of though, and predicts the Shekel “will increase 2% after breaching their so-called resistance levels.” Merrill Lynch, meanwhile, sees the Shekel appreciating an additional 10% over the next year. Should G20 Crack Down on Forex Speculation? Such bear raids are rarely to "discipline" a country’s policies, as traders claim, but rather to make quick profits. In the transparent FXTRS system, traders selling falling currencies begin to see that the rising tax is cascading into the country’s currency stabilization fund and cutting into their gains. A strong currency can be a curse for exporters, however. In New Zealand’s case, the carry trade has given the kiwi dollar an extra upward push. With the yen nearing five-year lows against the American dollar this week, such trades may well continue. China and Japan are no longer alone in their unofficial quest to pile up foreign exchange reserves. Indonesia just announced that its reserves have surpassed the $45 Billion mark, and to the surprise of no one, these reserves are largely held in USD-denominated assets. The announcement is significant for a few reasons. First, it means that Asian nations not lumped in with the Asian Tiger economies – Taiwan, Hong Kong, South Korea, and Singapore – have begun to reap some of the fringe benefits of economic growth, notably surging forex reserves. 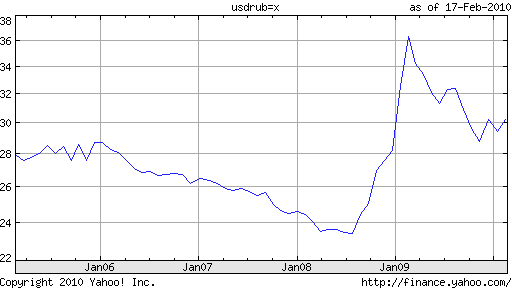 Second, it is symbolic of the fact that the USD remains the world’s de facto reserve currency. At the same time, it should make USD bulls quiver, because such countries could conceivably pile out of the USD just as quickly as they have piled in. The GCC’s single currency plan can go ahead with the absence of one member state, like in the eurozone where only 13 countries out of the EU’s 27 adopted the euro. With today’s post, I thought I would take a break from reporting on the major currencies and interest rate speculation, a topic which I feel has been beaten to death. A few weeks ago, Zimbabwe announced that it was issuing a new currency, in order to rein in activity in black market currency exchange. Many countries, including Zimbabwe, with ill-defined economic policies, are often severely constrained in their ability to conduct monetary policy because they don’t know how much cash is circulating. By issuing a new currency, the Zimbabwe government is effectively forcing its citizens to make known the amount of currency they possess, and may enable the country to draft a more practicable economic policy. Central bank Governor Gideon Gono knocked three zeros off all banknotes and devalued the local dollar by 60 percent in a bid to snuff out a thriving forex black market, where the exchange rate is nearly three times the official one. All told, last year saw the lowest degree of variability in the Aussie’s value in any year since the float in December 1983. The Kiwi is ‘near to the top of most people’s lists of things to sell this year’, with interest rates expected to fall. The real was further aided by a government announcement that it planned to sell more bonds maturing in 2015, a move likely to increase portfolio inflows into Brazil even further. 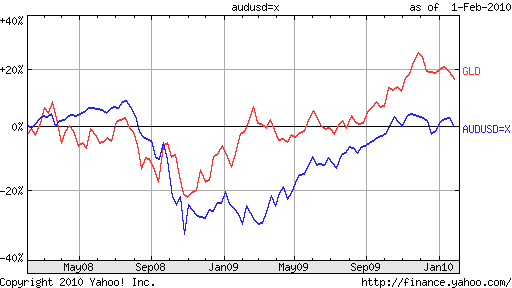 The real has now risen 31.7 per cent against the dollar since May 2004. [The Central Bank] revealed that it had squandered one-tenth of its reserves in a vain attempt to stem the rupiah’s fall. Despite a few high-profile foreign investments, the capital account remains lamentably in the red. Should the currency slide further and remain below Rp11,000-12,000 to the dollar for a quarter, they say, it would lead to corporate defaults and put pressure on the banking system. The Ministry of Tourism has projected RM59.4 billion in tourist receipts in 2010 from 24.6 million tourists. This compares to RM29.7 billion spent by a total 15.7 million foreign holiday makers in Malaysia last year. Many of the “baskets” that the private banks have created involve derivatives and options, which are designed to harness a current trend and give investors exposure to certain sectors without having to buy the actual investment. Brazil’s Central Bank voted for the second consecutive month to hold interest rates constant at 19.75%, which remain among the highest in the world. The Central Bank continues to target inflation in conducting its monetary policy. Specifically, it is aiming for 2005 and 2006 inflation targets of 5.1% and 4.5%, respectively. However, Brazil’s ultra-tight monetary policy may be counter-productive, as certain foreign investors continue to pour ‘hot money’ into Brazil’s economy in order to take advantage of the unnaturally high interest rates. If economists are correct in their estimates, the Central Bank will fail to meet its respective inflation targets for the next couple of years, which means current interest rate levels will likely endure in the foreseeable future. Amid intense speculation about a looming adjustment of the ringgit, Abdullah has said in recent weeks that Malaysia will not adjust its currency peg for the time being but is closely watching developments in the financial markets. "Provided the growth is accompanied by faster productivity, that will be much better," a UN economist said. "But if growth is accompanied by more investment, that will just drive up inflationary pressures in China, which has implications in the rest of the world." Local investors will be allowed to purchase overseas properties through real estate investment trust funds managed by the asset management firms. The government is also studying ways to relax rules requiring the domestic institutional investors to obtain prior approval from the regulators for the trading of financial derivatives products in overseas markets. [Unfortunately] most of the oil firms became racketeers, selling forex to a select few banks above the prevailing rates at the DAS (official market). Malaysia announced that it expects its economy to grow at only 5-6% this year, down from 7%. Economists attribute the slowdown to a decline in exports. As an emerging economy, Malaysia is heavily depend on exports (especially technology related exports) to fuel economic growth. However, a global decline in IT and technology spending has hit Malaysian exporters especially hard. Even with the artificially favorable exchange rate, maintained at value which experts estimate to be 20% below fair value, exports are declining. Bank Negara indicated speculation and short-term capital flows would not spark a change in currency policy. "The basis for any change would therefore be made on long-term structural considerations and not short-term movements in capital flows or transient shifts in exchange rate expectations," it said, adding that it could continue to absorb foreign inflows through money market operations. Despite raising interest rates to 19.25% this month, Brazil’s Central Bank is drawing increasingly harsh criticism from economists around the world. Their complaints are contrary to what you would expect, as many think interest rates are still too low! Under pressure to contain aggregate demand and inflation, the bank has raised rates by over 3% in less than a year. Last year, critics chastised the bank for not dropping rates quickly enough, when Brazil’s economy began to spiral into recession. This year, they have argued the bank’s monetary policy has had no discernible effect on Brazil’s economy. Brazil’s economy has long shown that it is responsive to interest rates. If there is an anomaly in the Brazilian case, it is not the limited potency of monetary policy or the lag between monetary tightening and the slowdown in the economy, but the starting point for interest rates. Brazil has only briefly seen real interest rates in the single digits twice in the past decade. India’s forex reserves set a new record. At $140 Billion, the reserves are now the 6th largest in the world. The record is due mostly to foreign capital inflows, which also continue to set records. Foreigners are pouring money into Indian stocks and bonds, in search of the typically high returns that emerging markets offer. Not only have share prices reached new highs, but so has the value of the Indian Rupee. They say signs China is still reluctant to allow its tightly pegged currency to strengthen had hardened the resolve of countries like India to keep their currencies under check. South Korean Won subject to manipulation? Some people believe foreign exchange markets are too big to be manipulated. Not so, says South Korea. It believes American hedge funds are responsible for the Won’s recent appreciation. South Korea has experienced net positive foreign capital inflows for quite some time. Hedge funds have been pouring capital into South Korea, hoping to simultaneously profit from the Won’s appreciation and the appreciation of South Korean equities. The hedge funds have also increased their purchase of non-deliverable forward contracts of Won. According to South Korea, this proves that speculators are the main culprit in the Won’s strengthening. The government is trying to control the foreign exchange rate by intervening in the market to enjoy short-term economic growth, which leads foreign investors to believe that the won-dollar rate will further decline. 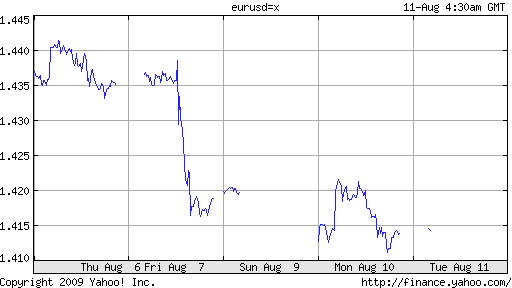 Central European currencies have been aberrantly strong of late. The Polish zloty has appreciated more than 20% against the Euro this year alone. Additionally, the currencies of Hungary, Slovakia, and Czechoslovakia have each appreciated more than 8% against the Euro, a currency that has itself appreciated by over 10% against the dollar. What is responsible for the sudden strength of Central European currencies? The answer is a combination of low interest rates and high economic growth. Investors have been pouring money into Central European equities, which offer the high returns characteristic of a developing economy. If this were not enough, creditors have been all too eager to lend money to buy Central European government bonds. Investors have been looking for an alternative to EU debt, which pays interest at a negative rate, adjusted for inflation. Spurned by interest rates of over 8%, creditors have sold EU bonds and snatched up ‘CU’ bonds. Moreover, investors do not regard Central European debt as incredibly risky, as EU is soon expected to extend membership to these nations. Subsequent cuts in interest rates have not had any effect on deterring foreign capital inflows. Central European governments have begun to worry that the sudden strength of their domestic currencies, could have a stultifying effect on their respective economies, which are largely driven by exports. They will most likely accelerate the pace of interest rate drops, to prevent any such slowdown. South Korea’s behavior with regard to its USD reserves has been nothing short of erratic. A few weeks ago, rumors that South Korea was planning to ‘diversify’ a large portion of its reserves (mostly into Euros), began to circulate. Economists and traders, alike, feared the worst. 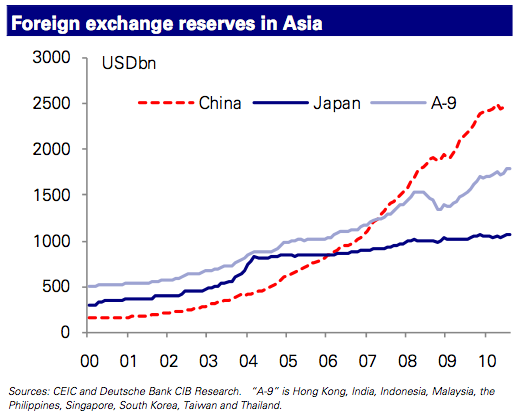 Would the rest of Asia, which collectively holds over $2 trillion in USD reserves, follow suit? The current system is looking more and more like a huge pyramid scheme. As long as Asian central banks stick together and buy dollar-denominated securities, things are fine. Once they start selling, virtually everyone loses — central banks experience capital losses and economies become less competitive. Read More: Is Kafka Running Korea’s Currency Policy? "We still have a lot of reserves to defend the peg because it is undervalued. But this will not work well if the currency is overvalued. As such, the ringgit must be allowed to appreciate gradually," said the executive director of the Malaysian Institute of Economic Research.